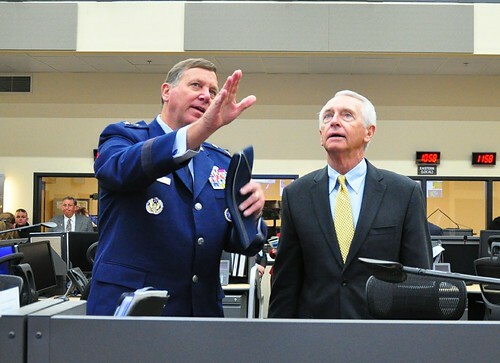 FRANKFORT, Ky. — Kentucky Governor Steve Beshear joined Maj. Gen. Edward W. Tonini, the adjutant general for the Kentucky National Guard and emergency management officials from across the state for a ribbon cutting ceremony for the new Commonwealth Emergency Operations Center at Boone National Guard Center in Frankfort, Oct. 21, 2013. The two-story, 26,150 square-foot facility replaces the former CEOC, built in the 1970s. The new building is constructed to withstand a variety of threats and weather conditions, including winds of up to 250 miles per hour. It is also outfitted with complete state-of-the-art communications technology to ensure rapid and efficient response during natural disasters and emergencies. To see more photos from the ribbon cutting, click here. Tonini called the CEOC a symbol of the commitment made to the people of the Commonwealth. He recalled stories from past floods and tornadoes that wreaked havoc across the state, with the emergency response coming from cramped rooms in an out-dated building. Beshear and Tonini both complimented the emergency operations staff and first responders in attendance, calling them the reason why Kentucky is a national model for emergency management. “Our emergency managers are among the best in the nation, and they have proven their worth time and time again,” said Gov. Beshear. 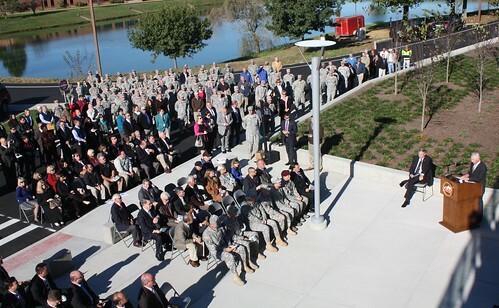 The new center is capable of supporting more than 200 personnel during a disaster response, including Kentucky Emergency Management, the Kentucky Guard, state and federal agencies and private partners. A large crowd gathered in front of the new building for the ribbon cutting including state and local elected officials. One in attendance has first hand knowledge of the abilities of those who will work in the facility. Pendleton County Judge Executive Henry Bertram spoke of the day he awoke to a completely flooded city in 1997. The rising waters of the Licking River devastated his county and surrounding areas. He contributed the resilience of the people affected to the work of Gov. Beshear and the agencies that will call the CEOC home. The new CEOC, funded at $11.8 million, was completed on time and at approximately $400,000 under budget. Nearly $10 million of the funding came from the Federal Emergency Management Agency’s Chemical Stockpile Emergency Preparedness Program. The Kentucky Department of Military Affairs and Office of Homeland Security provided the remainder.